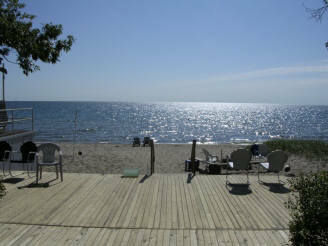 Are you looking for a place to relax with a good book, catch a walleye or perch? Fall asleep to the quiet of the north woods, listening to the lapping waves on the shoreline. Wake to a beautiful lake sunrise, refresh yourself and your family at Whitestone Pointe Cabins. Each cabin has 2 bedrooms ~ one with a double bed, one with 2 twin beds, living room w/TV, bathroom w/shower, enclosed porch, fully equipped kitchen w/microwave and coffee maker, refrigerator, and each cabin has it's own charcoal grill and picnic table. Everything is provided: sheets, pillows, bedding, bath towels, wash cloths, dish towels, pot holders, all you really need is groceries, clothes, beach shoes, beach towels! Our beachfront property offers each cabin a lovely view of Lake Huron, and the glass enclosed porch is the perfect place to enjoy your morning coffee. Walk along our beach to Whitestone Point, or north as far as 5 miles. Activities within 10 minutes of Whitestone include golf, shopping, boating, fishing, canoeing, hunting, dining & movie theater. Check-in time is 5 p.m. or call to see if your cabin is ready soonerCheck-out time is 11 a.m.
5883 S. Lake Lane Dr.